Indonesian police have arrested an alleged key people smuggler who has targeted Australia since 1999, Indonesian and Australian authorities said on Saturday. Abraham Louhenapessy was arrested in Jakarta this week for allegedly smuggling people into and out of Indonesia, said Indonesia’s national police investigator Agus Andrianto. The Australian government said in a statement that Louhenapessy, also known as Captain Bram, will be transported to Rote island in the Indonesian province of East Nusa Tenggara (NTT) to face court. “We know that Captain Bram is a key player in the people smuggling networks across Indonesia and we congratulate the Indonesian National Police on their determination to stop this criminal from risking the lives of any more vulnerable people,” Australian Immigration Minister Peter Dutton said in the statement. Louhenapessy was arrested over a failed attempt to send 65 mostly Sri Lankan asylum seekers to Australia from Indonesia in May 2015, The Sydney Morning Herald reported. “The man is wanted by NTT police for a case of human trafficking. We are backing up the NTT police for the investigation of this case. He smuggled people into Indonesia and out of Indonesia,” said Andrianto. Australian Minister for Justice Michael Keenan said Louhenapessy could face up to 10 years in prison. “We are extremely pleased this notorious people smuggler has been stopped… but we know there are more criminal people smugglers out there and we will continue to work with our regional partners to bring them to justice,” Keenan said in the joint statement. In its fight to stop people smugglers, Australia has adopted a tough asylum seeker policy which sees it intercept boats at sea and ship asylum seekers to Australian-funded detention camps in Papua New Guinea and Nauru. They are never eligible to be resettled in Australia. 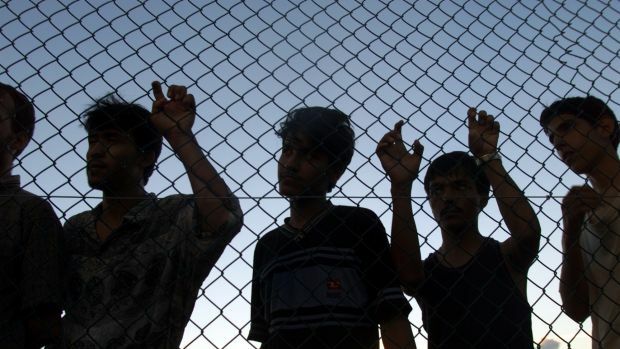 The United Nations and human rights groups have called for the closure of the camps, which have been rocked by riots, deaths, self-harm by detainees and reports of sexual abuse.